Saturday 17 March is the Feast of Saint Patrick, Principal Patron of Ireland. Below are some resources for use in parishes. From our April 2017 issue, Father Dermot Connolly of Africa Magazine reflects on the life of Saint Patrick, trafficked into Ireland a slave, and the slavery and human trafficking that persists in today’s world. Read his full article here. 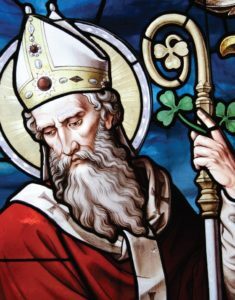 Watch a short video of Saint Patrick’s Breastplate or Lúireach Phádraig as it is known in the Irish language. The music and the arrangement are by Sister Marie Dunne CHF, a Holy Faith Sister from Dublin. The soloist on this piece is Patricia Bourke D’Souza. but who are absent from us. Keep them safe from all harm, evil and danger. the waning of energy or health. a wisdom and beauty from lives deeply inhabited. the natural shelter around their lives. may they return home to themselves. and humanity to make your home with us. that we may live in human solidarity and in hope.